My name is Milca, I’m 20 and from London. I want to say a big thank you to James and The Mix for supporting me during my time of crisis. I have EUPD, emotionally unstable personality disorder. It means that I deal with long episodes of depression, anxiety and panic attacks. I have also self-harmed and made attempts to take my own life. My disorder has caused a devastating impact on my life – not only has it affected on my studies, but it meant I often ended up in hospital. A few years ago I was directed to The Mix by ChildLine. 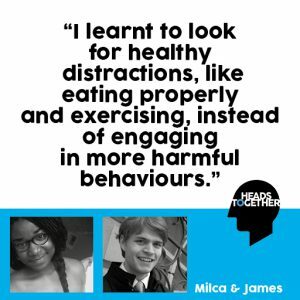 At the time I was experiencing problems with food and had worsening urges to self-harm, but after speaking to James and other in The Mix community, I learnt to look for healthy distractions, like eating properly and exercising, instead of engaging in more harmful behaviours. I then started using the discussion boards, and with James and The Mix’s encouragement, I found I was able to support others, using my own experience. I also was able to express how I was feeling – it felt good knowing that I had the platform to do that, like I was being heard. I’m currently studying for a BSc in Bioscience and I hope to be a clinical scientist or perhaps work in dentistry. I’m still an active member of The Mix’s community and just like James, I’m helping to provide a safe space for young people to talk about what’s on their minds and share support.